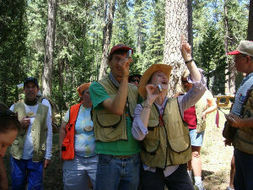 The Forestry Institute for Teachers is a multi-day residence workshop developed by the Northern California Society of American Foresters, University of California Cooperative Extension, Shasta County Office of Education, The California Department of Forestry and Fire Protection, and Project Learning Tree. The FIT Program is underwritten by a consortium of public and private sources. Since 1993, over 2,200 teachers have graduated from the program. FIT is highly regarded professional development program that emphasized California Department of Education Content Standards including Common Core and Next Generation Science Standards. FIT﻿﻿﻿+ is intended as a post-FIT professional development opportunity that emphasizes Project WET and Project Learning Tree. Learn more here. "What a wonderful program! FIT is by far the best professional development opportunity I have had so far. Very well organized, coordinated and orchestrated. Clearly a lot of time, energy, money and passion goes into pulling FIT together. Thank you so much for the opportunity to partake in such an AMAZING experience. Great job to the whole FIT staff and all of the contributing professionals and sponsors. You are an amazing group of people. We are all truly grateful for your time, dedication and expertise!" "What I liked best about FIT is that it is exceptionally well-organized with hands on activities, multiple perspectives, field-trips, dividing us by grade level for age appropriate activities,"